This month, thousands of tech enthusiasts will descend on the SIGGRAPH, a conference featuring innovations in graphics and interactive techniques, to experience the latest in hardware, software and services. One of those innovations will be the AIDS Quilt Touch project, a web-based mobile app that showcases panels of and allows users to interact with the world-renown AIDS Quilt. 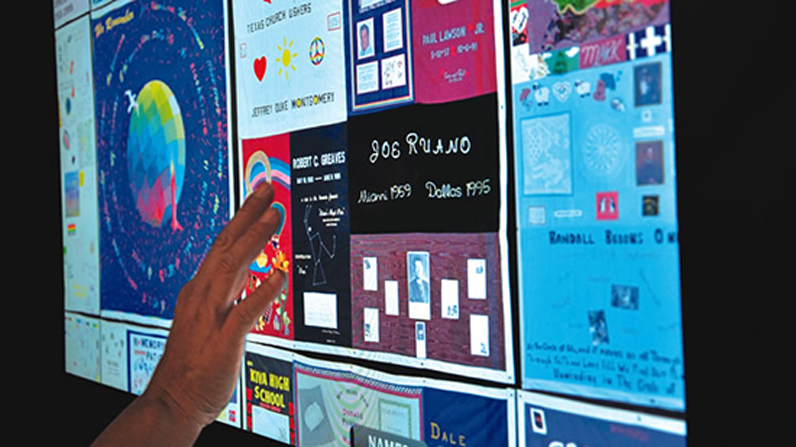 The Public Interactives Research Team (PIRT) at The New School, the group behind the project, will display a suite of technologies designed to enhance and expand viewers’ experiences of the AIDS Memorial Quilt in an installation which includes six of its 5914 12’ by 12’ sections. As the largest living memorial of its kind in the world, the AIDS Memorial Quilt is composed of 48,000 individual panels made by more than 33,000 people, and commemorates more than 93,000 names. If laid out in its entirety, the physical quilt would cover 1.2 million square feet. The AIDS Quilt Touch allows members of the public to interact with a digital representation of this important work of cultural heritage. PIRT will showcase several technologies, including an Interactive Tangible Browser, which utilizes an 55-inch multi-touch table that allows users to search for a name on a quilt panel and browse the virtual quilt; the Timeline for the History of AIDS and the AIDS Memorial Quilt, which employs a Microsoft 55-inch touchscreen that displays an interactive timeline recounting key episodes in the 30-year history of the AIDS pandemic and the 25-year history of the creation of the quilt; and The AIDS Quilt Touch Mobile Web App, which enables a web-user to search for a name on the quilt, view quilt blocks and comment on a specific panel or on the quilt itself. For more information, visit http://www.aidsquilttouch.org.